Kiska is one of the Aleutian Islands, a chain of islands stretching west from Alaska. Isolated volcanic islands with harsh weather and harsher terrain, they are virtually uninhabited. 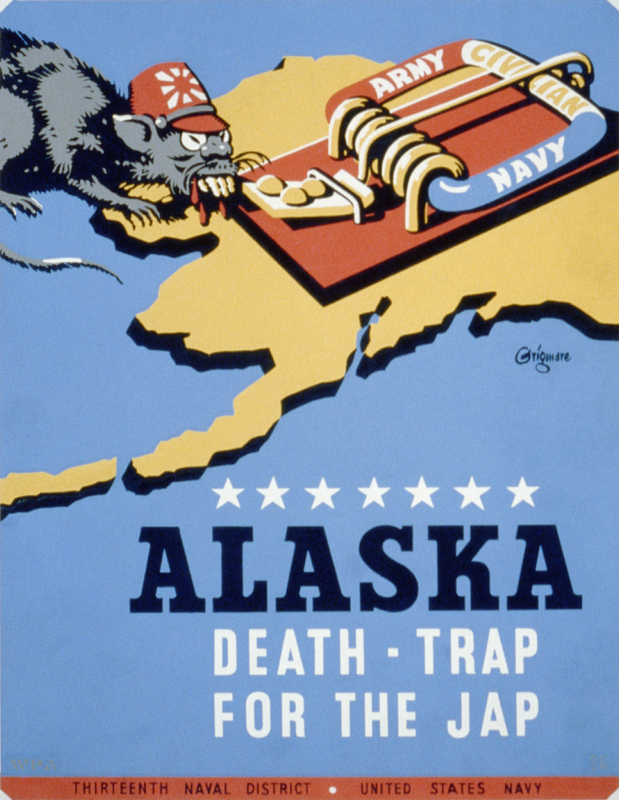 In World War Two Alaska wasn’t a state yet, but it was US territory. When war with Japan broke out in 1941, the islands were undefended. On 6 and 7 June 1942 the Japanese seized the islands of Attu and Kiska. A small weather station manned by the Navy was the only defence, its sailors were sent to Japan as prisoners of war. Until recently it was thought these invasions were a diversion to draw America’s attention away from Japanese plans to attack Midway Island in the mid Pacific, modern historians have argued that the invasions were simply part of a broader plan of defending the approaches to Japan from the North Pacific. The news of Japanese troops on Alaskan soil did not sit well in America, this was the one and only time in World War Two where Axis forces captured land in North America. American forces were sent to the region, and a number of air and sea battles were fought over the better part of a year. The Japanese at first attempting to push further east, then the Americans pushing back in preparation for retaking Attu and Kiska. None of the battles were decisive though, partly because of the relatively small forces involved on either side, mostly because the weather was so terrible that opposing forces often couldn’t locate each other, and when even they did, aircraft frequently got lost en route to their targets. In one memorable occasion, the Battle of the Pips, two American battleships fired over 500 large calibre shells at radar targets without scoring a single hit. It later transpired that there were no Japanese ships within two hundred miles and they likely had been firing at rafts of seagoing birds. In May of 1943 the Aleutian campaign was coming to a climax. The war was now going badly for the Japanese, with the Americans beginning their advance towards Japan on many fronts. 15,000 American troops landed on Attu Island. The landings were unopposed, but it went badly after that. Poor planning, inadequate equipment, and the terrible weather took their toll. And the Japanese had not opposed the landings because they had fortified themselves in the rocky volcanic interior of the island, they resisted fiercely when the Americans pushed inland. The Japanese were outnumbered 5 to 1, so the outcome was never really in doubt. On 29 May the Japanese commander led his remaining troops on one of the largest banzai charges of the war, or as we call them now, human wave attacks. The Americans were caught by surprise, and Japanese troops made it through the American lines and attacked headquarters and supply units in the rear. Brutal hand to hand fighting raged for hours, when it was over all but 29 Japanese solders were dead. In the course of the entire battle for Attu more than 500 Americans were killed and over 1,000 were wounded, a high toll for the capture of a island small garrison. Japanese losses in the battle? Zero. The Japanese had secretly evacuated their garrison weeks before, deeming the island indefensible. Losing hundreds of men capturing an undefended island was a little embarrassing to say the least, the Battle of Kiska is not one of the American military’s prouder moments. As military blunders go though, it’s rather minor. It’s not the only time in history where a battle has been fought even though one side failed to show up. I posted it because it’s an interesting story, and to illustrate that war is much messier and more error prone than Hollywood would have us believe. Now there’s a topic I’m going to have to research.